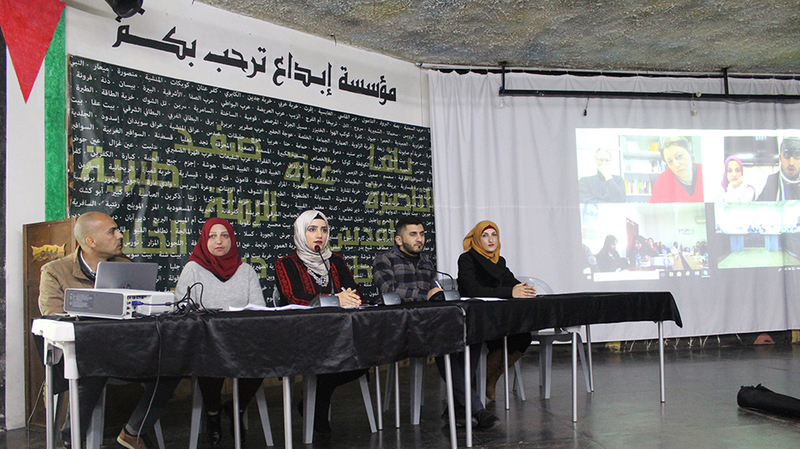 The Center for Development Studies at Birzeit University examined alternative development concepts in the conference “Rooting Development in the Palestinian Context” together with Palestinian civil society organizations from Palestine and Palestinian communities abroad and the University of Vienna on Saturday, January 26, 2019. The conference, held at the Ibda'a Cultural Center in Dheisheh Refugee Camp, Bethlehem, expanded upon the “Rooting Development in the Palestinian Context” project that offers critical readings of development in Palestine after the Oslo Accords. 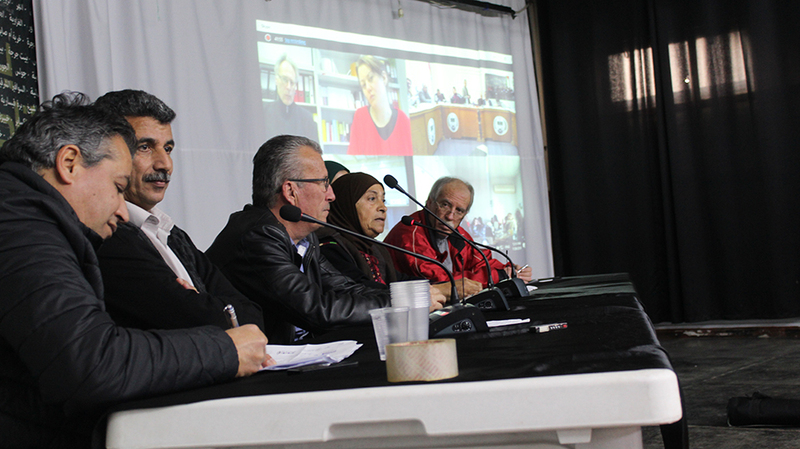 Bringing together Palestinian and international partners under one roof and via videoconference, the conference promoted critical dialogue and the exchange of knowledge and experiences. It fostered a collective examination of the methods by which the current models and practices applied in various communities could be improved through the sharing of resources in order to strengthen grassroots-based forms of development. In his welcoming remarks, Ayman Abdel Majeed, Survey Unit researcher and coordinator at the Center for Development Studies, hailed the conference as the culmination of three years of joint Palestinian and international efforts to dissect and contextualize development in Palestine, noting that the project is unique in encouraging youth-led discussions and debate sessions. Director of the Center for Development Studies Linda Tabar gave a brief overview of the project, summarizing its goals, objectives, and outcomes. Tabar focused on the project’s ability to present a critical, evaluative view of development in Palestine 25 years after the Oslo Accords as it outlined the relationship between colonialism and development, focused its efforts on producing knowledge that builds communal consciousness, and matched that knowledge with action to dismantle colonialism. Saleh Abu Laban, chairman of the Ibda'a Cultural Center’s board of directors, emphasized the importance of such Palestinian initiatives and projects, asserting that by developing the Palestinian community and building the economy an independent Palestinian state can be achieved. Helmut Krieger, coordinator of the Rooting Development project at the University of Vienna, remarked that holding the conference at the Dheisheh Refugee Camp underscores the significant role of refugee camps in efforts to achieve Palestinian independence, despite the borders and limits imposed by the Oslo Accords. The initiative, he noted, re-invites Palestinian youth and women into the fight for Palestinian statehood. Ali Abu Zaid, the project’s coordinator at Al-Azhar University in Gaza, similarly stressed the project’s importance in giving Palestinian youth, whether in Palestine or abroad, the space and means to contextualize development to fit Palestinian needs. Kassem Sabbah, director of Mousawat Organization − a rights-based civil society organization in Ramallah − and the project’s coordinator in Lebanon, expressed his concern over the lack of a unified body that represents Palestinians abroad, stressing that a unified front is essential to secure Palestinian rights. The conference comprised three sessions. The first, titled “Reflections from the Field – Fieldworkers’ Perspectives,” featured Islam Jamal and Aseel Khaldi, two field researchers who discussed concerns of the Palestinian diaspora in Jordan; Rawya Mousa and Farah Khatab, who explored the Palestinian diaspora in Lebanon; Samar Haroon and Belal Najjar, who studied the experiences of Palestinians living in Gaza; and Ghada Shafout and Anas Lahaseh, who analyzed the experiences of Palestinians living in the West Bank. The second session, titled “Alternatives from the Field – Activists’ Perspectives,” featured discussions on the experiences of activists in grassroots movements or civil society organizations. 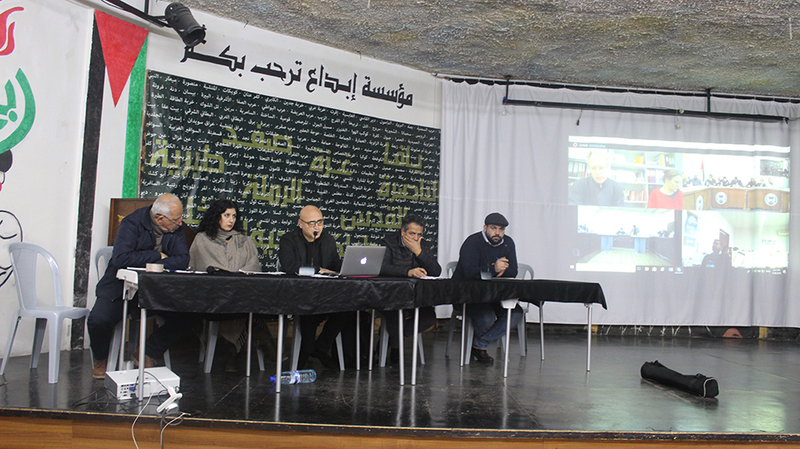 The session included Bassem Tamimi, Salah Khawaja, Fatmeh Brijya, Nesreen Al- Azzah, Khaled Saifi, Amjad Elian, Salma Rashdan, and Sufian Shenbari, with Abaher Al-Sakka and Linda Tabar as panelists. The final session, titled “Critical Readings – Researchers’ Perspectives,” was chaired by Jamal Juma’, Monther Ameera, and Kassem Sabah and featured presentations by researchers who were involved in the “Rooting Development in the Palestinian Context” project and detailed their experiences and concepts regarding the contextualization of development in Palestine. This session included Ayman Abdul Majeed, who discussed alternative methodologies and concepts in development; Ali Amer, who gave a Marxists perspective on development; Helmut Krieger, who explored the relationship between knowledge and resistant development; and Abaher Al-Sakka, who presented a critical reading of field knowledge.